The sweltering heat of Manila finally took its toll on us and we finally decided to eat somewhere closer to the office. Burgos Circle was our destination, but since we frequent the place, we didn’t know where else to eat. With Mimie gone, we had no particular cuisine in mind. We honored Mimie’s absence (she flew to Japan) with a meal in a Japanese restaurant. Tucked around a bend, the restaurant was not busy on a Friday lunch. The cozy modern interior was refreshingly not too Japanese, but the teacups and plates gave the theme away. We started off with Maguro Togarashi Sashimi. 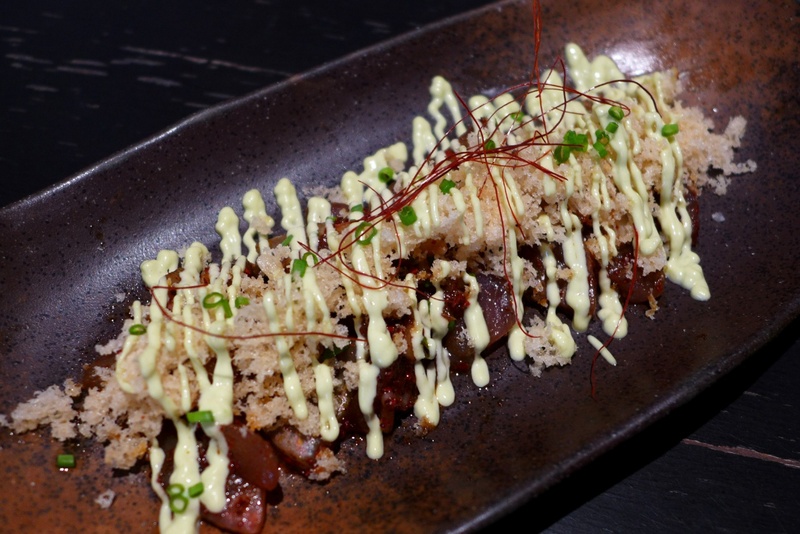 Shying away from the usual sashimi, the dish is drizzled with Japanese mayonnaise. 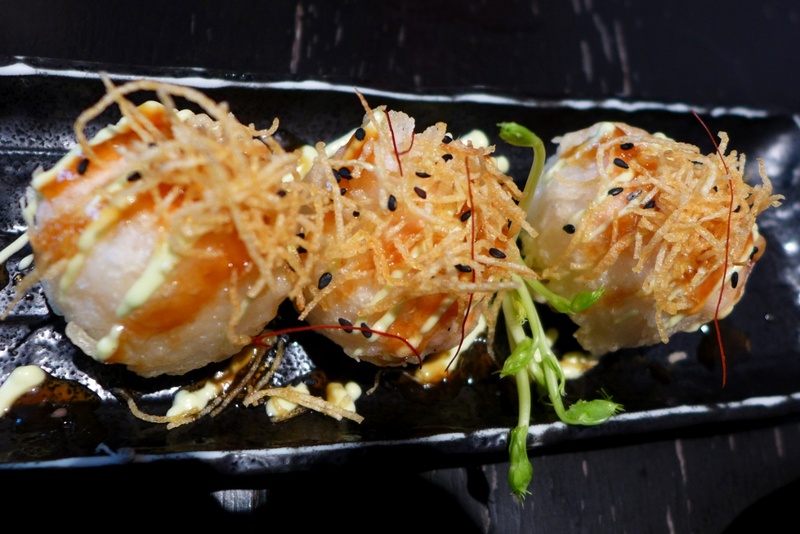 The fish itself was already flavored with some spices, and crunchy tempura batter sits on top. The wonderful kick of spiciness and the crunchy texture meshed really well, and you could hardly take your chopsticks down once you start munching. It really was a remarkable sashimi. The Dynamite Roll followed, but the sashimi set the bar high. This roll was not quite what I wanted it to be. The spicy flavor was just too weak for it to create a great explosion in my mouth. The Manhattan Roll soon arrived. It took me by surprise since the plate was full of sushi balls, rather than a roll cut up in bite size servings. Again, the restaurant played up the texture and flavor partnership, yet this one was less successful than the sashimi. But the cuteness of the Rainbow Maki would win the hearts of many. It was the most photogenic of the dishes that we ordered. 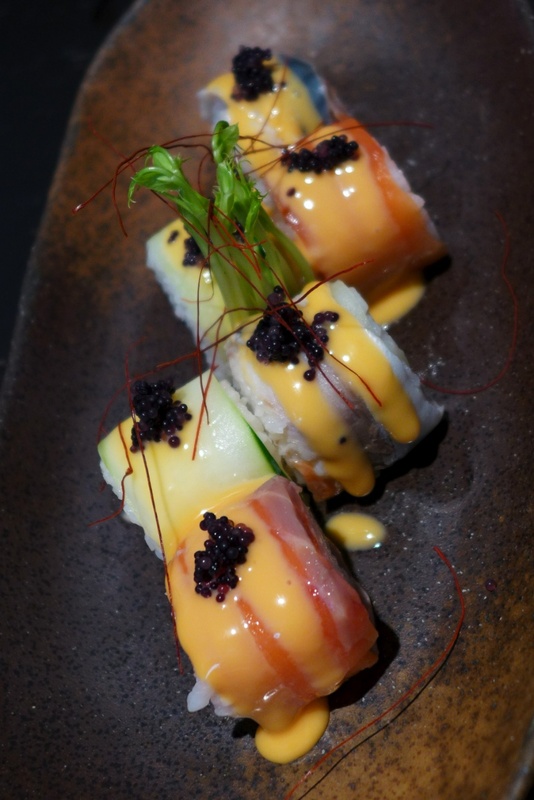 Each piece of rice is wrapped in a different ingredient, some with fish and others with vegetable, drizzled with some kind of dressing and topped with a minuscule serving of black caviar. 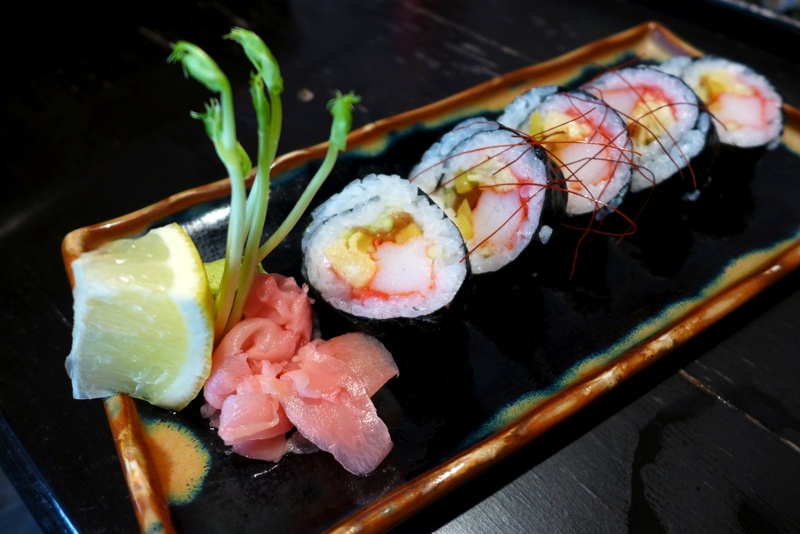 If you love raw fish, get that one and fall in love with this dish. The cucumber one paled in contrast with the fish version. Our initial plan was to just eat sashimi, maki and sushi. But in the middle of placing our orders, we managed to squeeze in some noodles and tempura. The yakisoba was great. 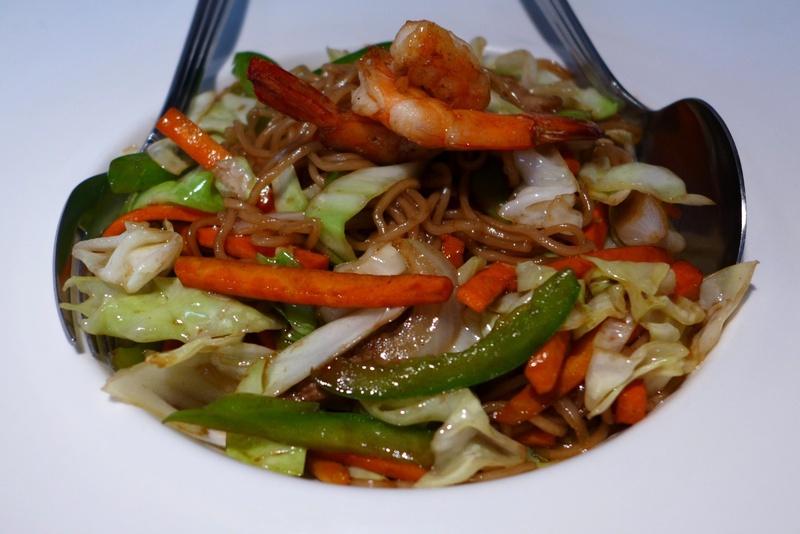 The noodles were firm, and the vegetables were cooked just right. The tempura moriawase, on the other hand, was a far cry from the great dishes. We were still hungry, so we ordered a couple of plates of maki. 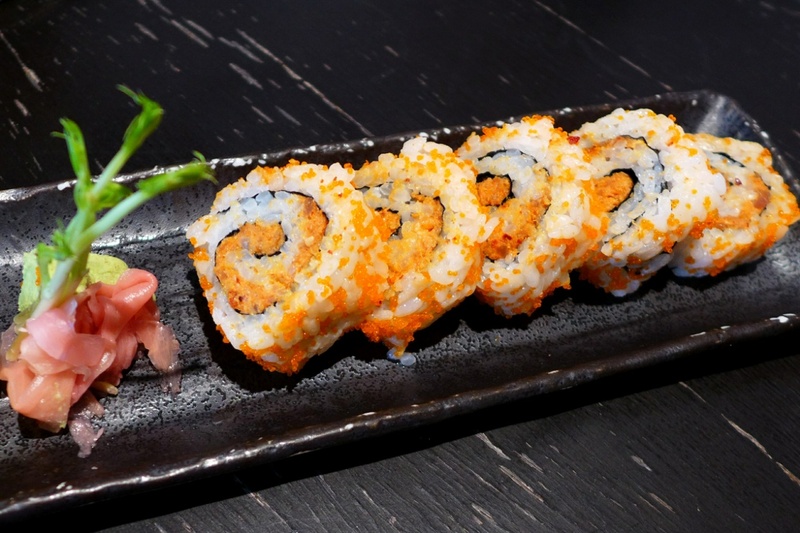 The cream cheese gave oomph to an otherwise boring maki in the form of the Philadelphia Roll. Their Futomaki was skinny! It was the smallest futomaki I’ve ever had, a blessing when you put it in your mouth, yet it becomes not so when you taste it. I could hardly taste the ingredients. Perhaps it’s one of those times when the fat would have won over the skinny. I wish I discovered this place sooner. I love their food.